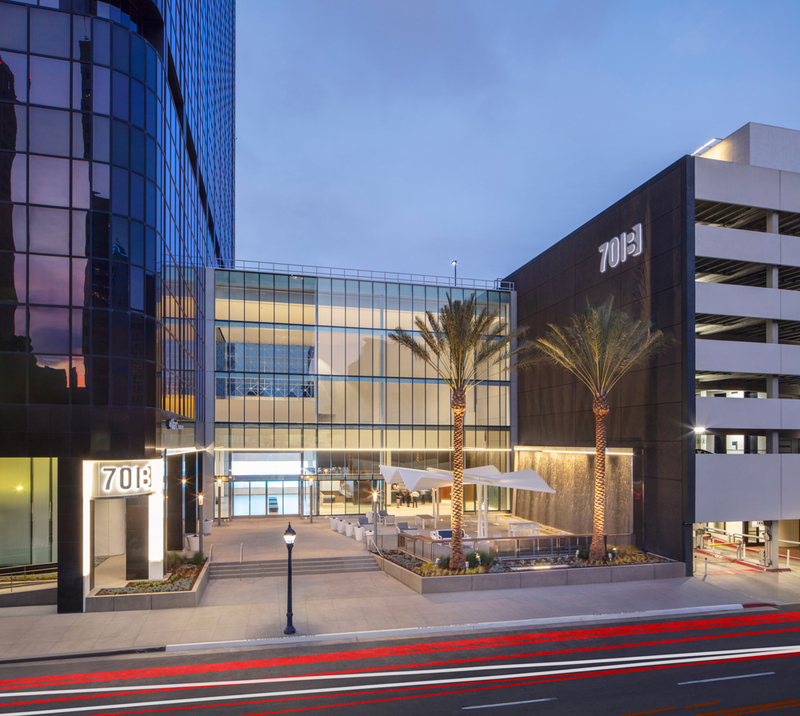 SAN DIEGO, CA -– EMMES Realty Services of California LLC (EMMES) has completed an iconic, multi-million-dollar renovation of the 7th Avenue plaza and atrium lobby of 701 B Street (701B) in downtown San Diego. The most dramatic change to the lobby was the removal of the angled space frame glass wall which inhibited views into the lobby due to the dark reflective glass. The new, straight vertical glass wall nearly doubles the size of the outdoor amenity plaza along 7th Avenue. In addition to the 65-foot tall clear glass wall, is the new water wall feature spanning over 50 feet long and nearly 20 feet tall, making it the largest vertical water feature in downtown. A white sculptural trellis floats above the plaza providing shade and inviting tenants and visitors to experience its transformative qualities as viewed from different angles. A dynamic, luminous textile light wall sets the mood within lobby as it changes colors and themes throughout the day. 701B – a center of commerce and finance within downtown San Diego – Class A, 24-story office building with expansive views. In addition to striking architecture, best-in-class amenities and an impressive lobby, 701B is within walking distance of the newest generation of downtown’s residential high rises and civic destinations such as City Hall, Symphony Hall, the Opera, and new Central Library.